Dried fish oatmeal for breakfast? Win a copy of Around the World in 80 Purees! We're giving away a copy to a lucky reader. Enter here by Sept. 14. It’s not everyone’s idea of a mild starter food, but it’s what babies in Japan commonly eat, sometimes topped with flaked salmon, umeboshi (pickled plums) or freshly grated ginger with a drizzle of honey! You might also be surprised to learn that Indian babies eat all sorts of spiced lentils, rice and curried vegetables as early as six months old, while Chinese babies feast on congee (rice porridge) with bits of mashed sweet potato or dried fish. International thinking is that babies should acclimate to native tastes as soon as they are ready. In this way, babies are exposed not only to a variety of spices (everything from cumin to cinnamon to chili powder) but also to a wide array of ingredients as well (fruits range from guavas to mangoes, vegetables include mustard greens and spinach and grains range from millet to sorghum). The United States stands in stark contrast to the international philosophy of feeding babies a variety of seasoned foods. 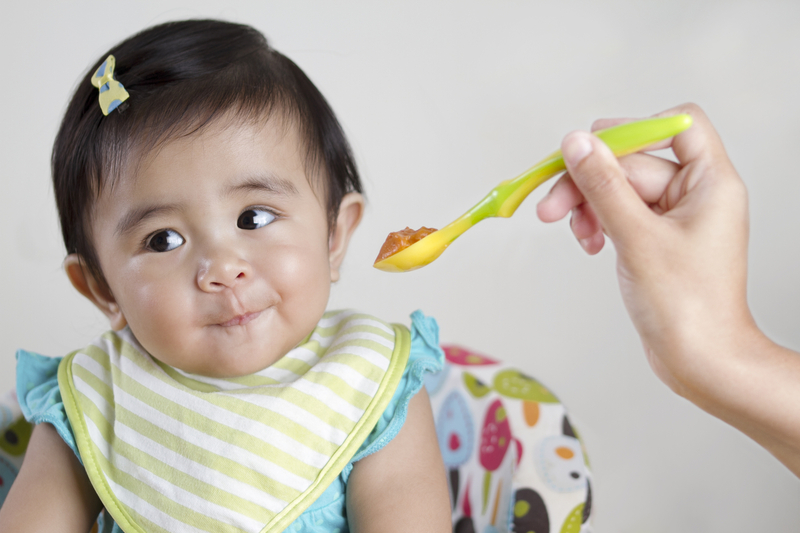 Most babies in the U.S. are offered a sadly limited and bland range of food choices. Puréed apples, bananas, carrots and strained peas from a jar. Even if homemade, the meals are usually devoid of seasonings and are one-dimensional. Dried, tasteless baby rice cereal, which is reconstituted with water or milk, is a common first food for a 4-month-old (it tastes a bit like cardboard). Baby and child meals are lumped into their own category, apart from adult meals. Why is this important? Because depriving babies of full-flavored food sets them up to shun variety and flavor as they get older. Science has shown us that babies who are exposed to a variety of tastes from the start grow up to be more adventurous and less fussy eaters. The evidence is all around us. Have you ever browsed the children’s menu at a nice restaurant? You will find macaroni and cheese, chicken nuggets and French fries. The opposite is true in other countries, say in Japan, where a young child is often seen eating sushi alongside her parents. Science has shown us that babies who are exposed to a variety of tastes from the start grow up to be more adventurous and less fussy eaters (babies have anywhere between 2,000 to 10,000 taste buds that need to be nurtured). Even while in utero babies are able to taste what their mothers are eating via the amniotic fluid they are drinking. Breast milk also takes on flavors of the mother's daily diet, which in turn familiarizes baby with new tastes every day. How can we in the West tantalize our babies’ taste buds like parents around the world do for theirs? One simple way is to spice it up! There are, of course, spices that are more “baby-friendly” than others and these are the ones to focus on when introducing new tastes to your little one. Parents often hear the words "spice" and "baby food" and are sometimes a bit intimidated. We associate the word "spice" with something that makes food hot or spicy such as chili powder, but it is worth remembering that not all spices are spicy. In fact, spices are defined as "any of various aromatic vegetable products (as pepper or nutmeg) used to season or flavor foods." Also as "something that gives zest or relish." 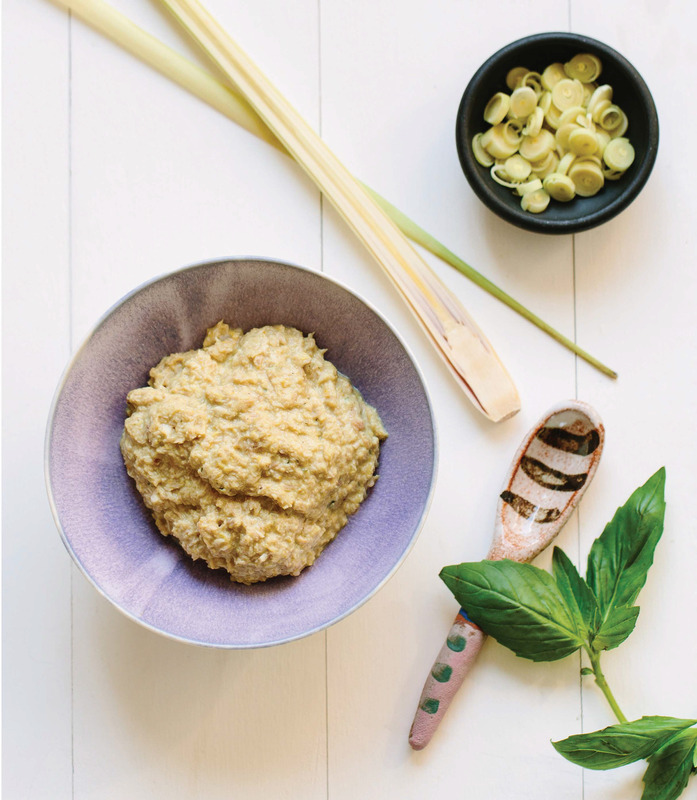 You can add zest by using baby-friendly spices, herbs and diverse ingredients from around the world. Baby-friendly spices are those that are relatively mild, easy on new taste buds, and simple to digest. They are not short on flavor, just the heat. Spices such as cinnamon, saffron, cardamom and clove, which are easy to add to fruit sauces and oatmeal. Savory spices, such as basil, coriander, cumin and turmeric pair well with vegetables and add depth and simple yumminess to your little one's first bites. When your baby becomes comfortable with a certain food, say mashed banana or applesauce, kick it up a notch by adding a pinch of this or that from your baby’s spice cabinet. Start with ground cinnamon (one of the most baby-friendly spices, in my opinion) or a few saffron threads. Over time you can add multiple seasonings and different ingredients to broaden baby’s palate, working up to full-seasoned meals — even adding a tiny drop of hot sauce or vinegar. Try fresh-squeezed lemon juice with vegetable purées (vary the vegetable also — instead of carrots, try parsnips with dill; instead of spinach, try kale with garlic) or a dash of fish sauce to soups and meats (think salmon with lemon or chicken with coconut milk). Think of flavors you enjoy and incorporate them into your baby’s meals. Just remember to go slowly and don’t give up when introducing baby to a new ingredient or spice. One of the most common mistakes parents make is assuming their baby doesn’t like something because they spit it out. Taste buds are like anything else in the body, growing and developing at their own pace. They simply need practice in recognizing and appreciating new flavors. Above all, have fun with food! The gift of appreciating flavor is a lasting and tasty present only you can give to your little one. Yogurt is a traditional Afghani condiment and ingredient, often made fresh at home every few days. It’s used in kadu borani (pronounced “ka-doo bore-ah-nee”), a side dish made by frying pumpkin (kadu) with a sweet tomato sauce that is served topped with garlic-mint yogurt (borani). 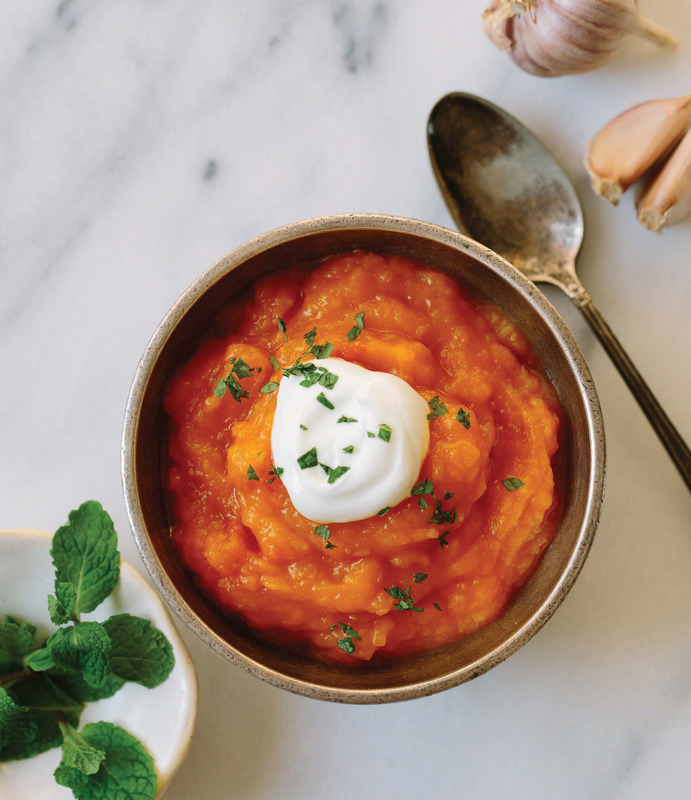 You can substitute any squash for the pumpkin, or use canned puree. Prep: Preheat oven to 350° F. Remove pumpkin stems. Cut pumpkins in half and use a spoon to scoop out seeds. Cut each pieces in half again and place on a baking sheet. Bake for 45 to 50 minutes, until soft and fork-tender. Let cool and peel skin, which should come off easily. Puree pumpkin and a few teaspoons water in a mini food processor or blender. Make: In a 2-quart saucepan, heat oil over medium-low heat. Add tomatoes and sauté for about 5 minutes, until saucelike in consistency and beginning to turn dark red. For babies younger than 8 months: Add pumpkin and mint to tomatoes and cook for an additional 1 to 2 minutes. Let mixture cool, then puree in a mini food processor. Serve at room temperature. For babies 8 months and older: Add garlic and coriander to tomatoes. Sauté for 5 minutes, until mixture is reduced to a thick sauce. Add pumpkin puree and cook for an additional 1 to 2 minutes. Top with a dollop of yogurt and a pinch of mint. Serve warm. This is a fast and flavorful curry. The saffron lends a lovely fragrance and ochre color but can be omitted if you don’t have it. For a heartier curry, add ½ cup cooked diced potatoes. Make: In a 1-quart saucepan, place coconut milk, chicken broth, turmeric, cinnamon, and saffron (if using). Bring to a slow boil over medium heat. Add vegetables and cooked chicken (if using) and lower heat to maintain a simmer. Cook for 5 to 7 minutes, until vegetables are cooked and flavors have come together. Let cool for 5 minutes. Serve: For babies younger than 9 months, puree in a mini food processor. Leaves as is for babies over 9 months old. 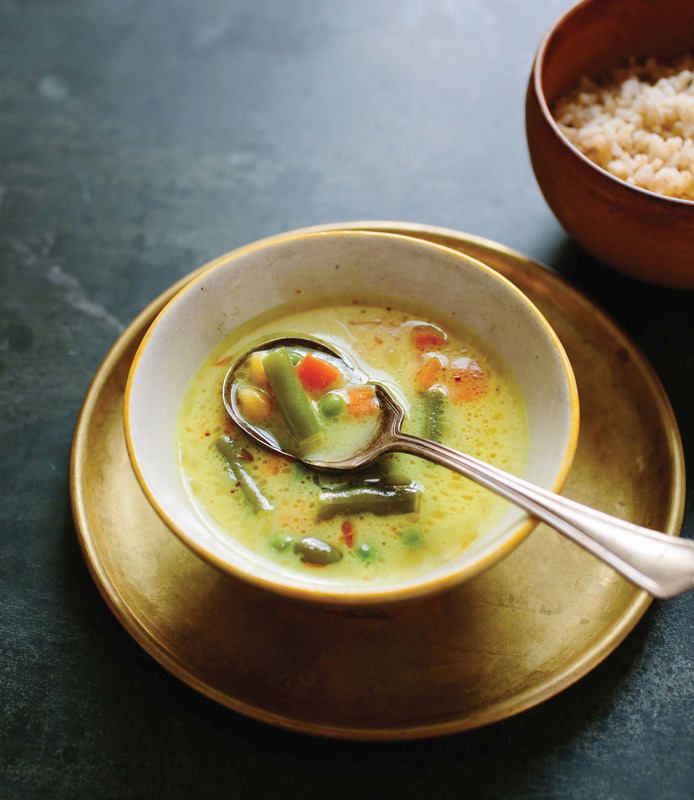 Serve warm with fragrant white or brown jasmine or basmati rice. 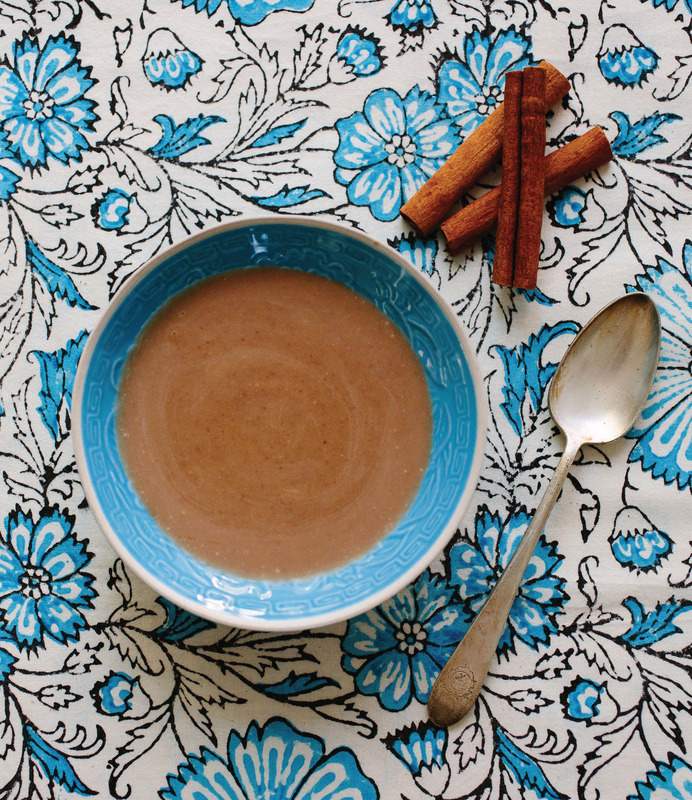 Habichuelas con dulce (pronounced “ah-bee-chweh-lahs cawn dool-seh”) traditionally is served in many Dominican households during Lent and also as a food for babies. This baby-friendly version uses a bit less milk and sugar than the original; the sweet potatoes and raisins lend natural sweetness. And it’s packed with nutrition—protein and fiber from the beans and vitamin A and beta-carotene from the sweet potato. Prep: Pick over kidney beans for small stones and detritus and then rinse. Place in a bowl with a generous amount of water and soak overnight. The next morning, drain beans and discard liquid. Make: In a 2-quart saucepan, place beans, 4 cups water, and raisins. Bring to a boil over medium-high heat and cook, adding water if the level over the beans drops to less than an inch, for 45 to 55 minutes, until soft. Toward the end of cooking time, mash beans with a wooden spoon or potato masher. In a 1-quart saucepan over medium-high heat, bring sweet potatoes and enough water to cover them to a boil. Cover, reduce heat to medium-low, and steam for about 7 to 10 minutes, until potatoes are soft. Drain and set aside. Transfer cooked beans and potatoes to a mini food processor and puree with a little water to achieve a thick, souplike consistency. Use a strainer to remove pieces of skins and other solids. Return strained mixture to pot and add coconut milk, cinnamon, and cloves. Cook for 10 to 15 minutes over medium heat, until mixture reduces a bit and is creamy. Serve: Serve warm or at room temperature. ThailandFor babies 6m+, makes 2-3 servings Poaching guarantees a moist dish flavored with whatever herbs and aromatics are in the cooking liquid. In this recipe, the lemongrass, basil, and even the coconut milk imbue the chicken with quintessential Thai flavors. Prep: Using a mortar and pestle, grind lemongrass, garlic, ginger, basil, and curry powder into a fragrant paste. Make: In a 2-quart saucepan, stir together stock, coconut milk, turmeric, and most or all of the paste, or less to taste. Add chicken pieces. Chicken should be mostly—but not completely—submerged. Bring to a boil, cover, reduce heat to low, and simmer for 15 to 20 minutes, or until chicken is cooked through. Serve: For babies, puree in a mini food processor with a bit of cooking liquid as necessary to achieve desired consistency. Serve minced to toddlers. 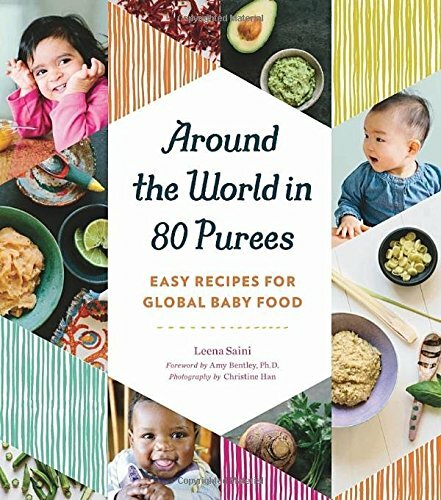 Recipes excerpted from Around the World in 80 Purees: Easy Recipes for Global Baby Food by Leena Saini. Reprinted with permission from Quirk Books.